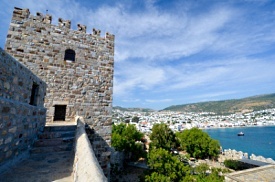 Spread out between two crescent bays, Bodrum exudes an "artsy" ambiance. With its white houses and flower gardens, it is one of the prettiest resorts on the South Aegean coast. Bodrum is easy to get around on foot. From the center square small streets fan out, lined with shops selling arts and crafts, leather, jewelry and carpets. Artists display their works along the harborfront. There is also a market offering a variety of clothing and local produce.